Includes: Pre-trip safety and paddling instruction, PFD and helmet, squirt gun, transportation to and from river, riverside snack and drink, photo presentation of your adventure. Note: Maximum weight for Double is 350lbs. 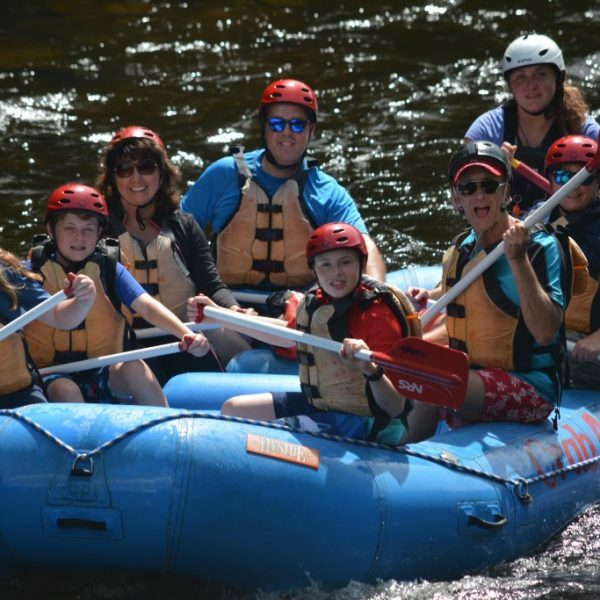 Schedule: The Deerfield River Funyak trip runs nearly every day from mid May through September thanks to daily dam releases. 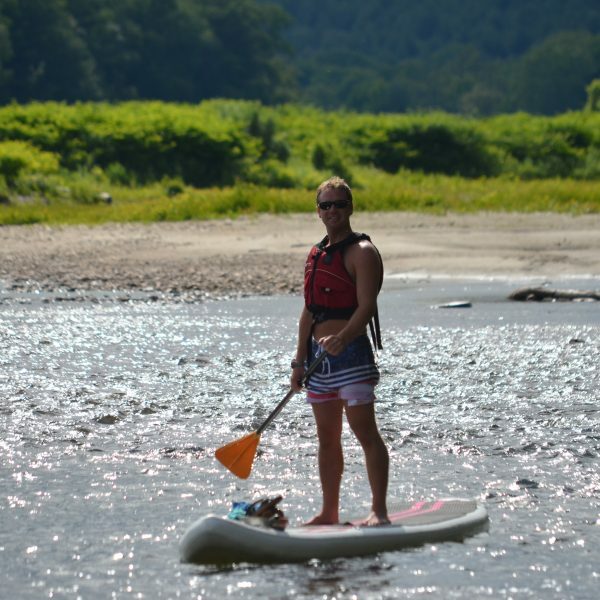 On a beautiful, lower section of the Deerfield River, we offer our inflatable kayak or “funyak” trip. Funyaks are self-bailing, inflatable kayaks carrying one or two people. They are very stable and comfortable with room to stretch your back and legs on a soft surface. Even with no prior experience you can enjoy the thrills of river kayaking with us. 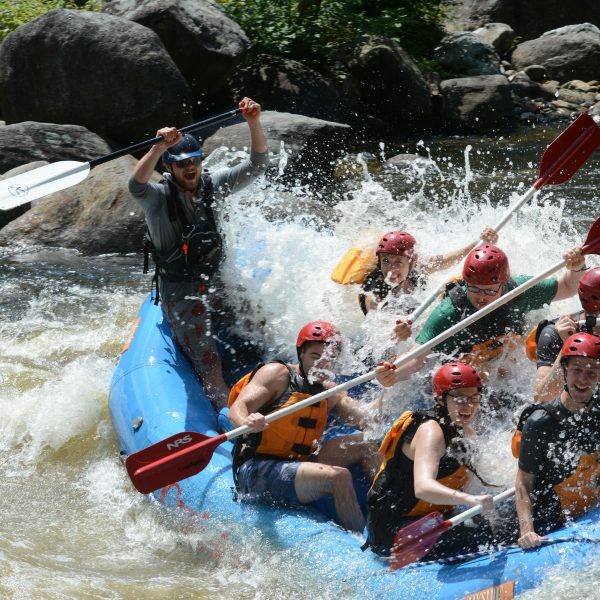 The Funyak trip is an eight mile afternoon adventure in fun Class I-II whitewater. A pre-trip safety and paddling lesson prepares you to conquer the river and small rapids such as “Chicle River” and “S-Turn.” Giant squirt guns and a nice snack half-way through the trip are also provided. Go at your own pace – move quickly or float for miles in the warm sun. In the deep, calm sections you can jump out and swim or engage your friends with the squirt guns. After a beautiful paddle, you end the trip back at our riverside base camp where you can get dry, grab a snack and see pictures of yourself and your group paddling down the Deerfield. There is nothing quite like challenging the river by yourself – try this solo adventure this season! 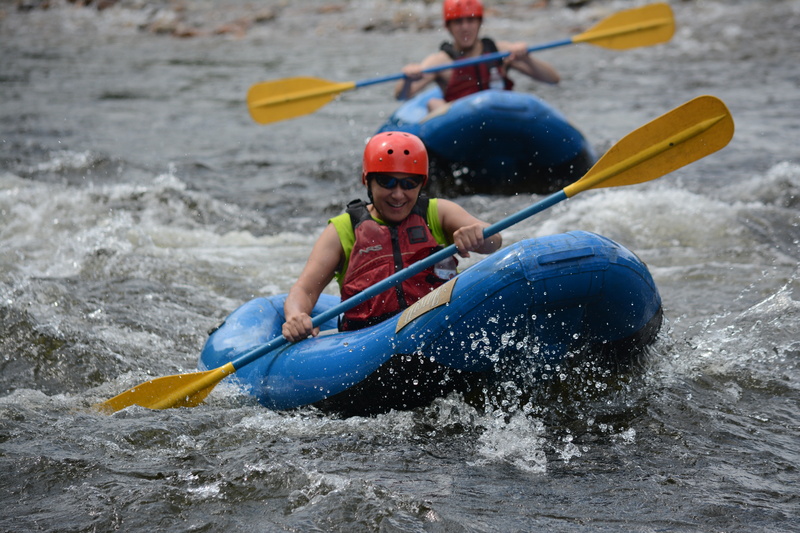 Why Choose Crab Apple For Massachusetts White Water Rafting? We are a three-generation family-owned company and we love what we do! Since our inception in 1983, our family has been imbedded in every aspect of our business. We are the reservation takers, the guides, the guide trainers, and the customer service specialists. Every detail of our business is infused with our fun vibe and family-oriented atmosphere. 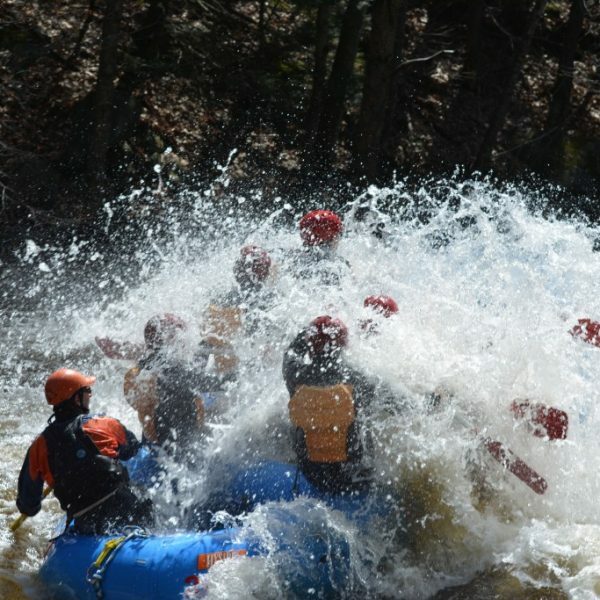 As a result, we have grown exponentially and we are proud to have the largest New England white water rafting operation. 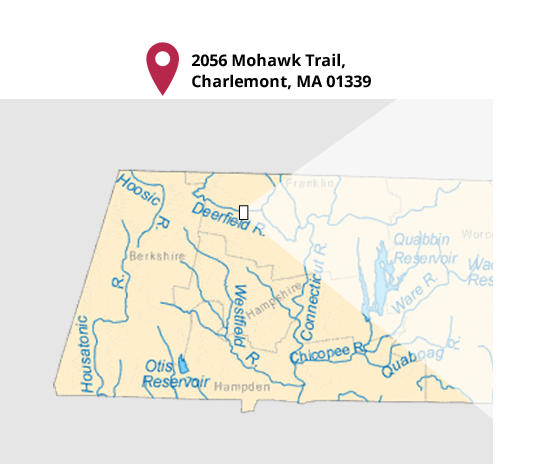 Our Massachusetts base camp sits along the beautiful Deerfield River. Cookouts after trips on the outdoor patio above the river are delightful. 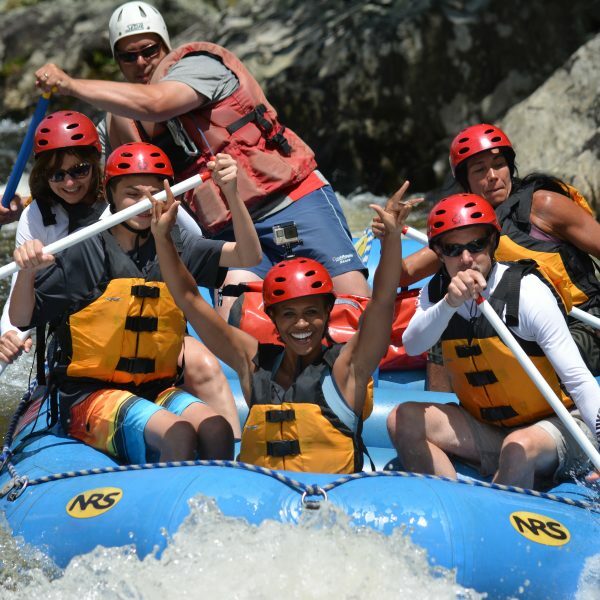 Two of our trips float right to our base so there is no shuttle ride after rafting! Our base includes a fun souvenir shop, a comfortable space to watch photos of your rafting trip, a beer and wine liquor license, comfortable changing and restroom facilities. As much as we love having fun, we always keep your safety a priority. We have over 100 rafts and inflatable kayaks of different sizes to ensure the best experience on the river. Our stock of over 400 wetsuits and lifejackets are continuously upgraded and come in a vast array of sizes to fit you comfortably and keep you safe. Click a pin to explore more about a particular part of the river.